NEW for Autumn 2018! Textile course with Kathleen Murphy, the Maker behind Murgatroyd & Bean. By encouraging a more experimental approach, this short course aims to dispel the 'stuffiness' sometimes associated with hand embroidery. Each week we will concentrate on a different topic or technique through a series of samplers which will be brought together as a cloth book in the final session. 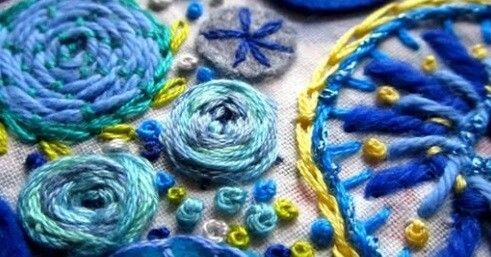 By the end of the course, Kathleen will have introduced you to concepts such as Stitch Families, Embroidery Sums and Seasoning stitches, to equip you with a good grounding on which to continue your hand stitch doodling beyond the course. It promises to be a fun five weeks! Skill Level: suitable for all abilities from beginners to those who wish to refresh their hand embroidery skills. You will need to bring: a 6" or 7" embroidery hoop, needlecase & embroidery scissors. All other materials will be provided. £120 per person. LIMITED PLACES available. To secure your place go to https://www.newbreweryarts.org.uk/creative-hand-embroidery.